Can my Wedding Shower be held there? What about our Stag and Doe? When it comes to event coordination, we’re the region’s hospitality experts! The staff here at Prescott gears up for special events. Kind of like the cast of a play, or a sports team. We all know our roles and we take care of every last detail for you. We’d be happy to host any or all of these functions for you. For a comfortable wedding, 180 guests is doable. We’re licensed for 250 but realistically 200 is our optimal top end for attendees in order to see to everyone’s needs. The venue boasts high ceilings, wrap around windows, a beautiful scenic view of our lush golf course in the summer and a winter wonderland in the snow. The spacious dining area with the kitchen and bar centrally located adjacent also has a dance floor at the west side of the room. We are open year round. You are able to custom make our venue as special, unique or particular as you desire whether your style is more simplistic and demure or lavish and elegant. Prescott Golf Club offers a variety of menu packages to suit any budget. We will work with you to customize your dining requirements to accommodate you whether that would be cocktails, a three course dinner, buffet, or just hors’ doeuvres. Your choice. No worries about where you and your guests are going to park at Prescott Golf Club – we have abundant free parking……not like the paid parking in most cities. Another beautiful wedding setup at PGC. We can make your Wedding Day much more than you can possibly imagine! 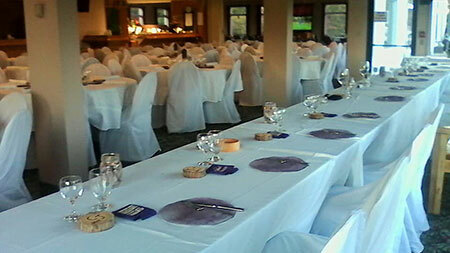 You will be surprised at the great value on banquets at Prescott Golf Club. Let us take the time to understand your needs by meeting with our Event Coordinator. We welcome the opportunity to be at your service and look forward to hosting your special events. In Ottawa? Come on down. We’re just a short drive! Next step for you is to provide your “details” in the form below and click Send. Our Event Coordinator will get in touch with you shortly.